In the book A Wrinkle in Time, it says that time is like a big old rumpled blanket. What I’d like is to be caught in one of those wrinkles. Tucked away. Hidden in a small tight fold. 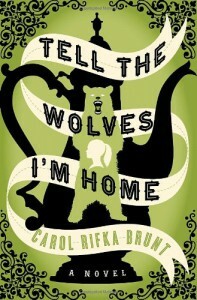 In Tell the Wolves I'm Home we meet June and Greta, sisters who have lost the close relationship that they had growing up. Their uncle Finn is dying of AIDS. It's 1987, the AIDS epidemic is claiming more victims and scarring people. But Junie just loves her Uncle Finn and doesn't really understand the magnitude of this disease or what it really means. I have to say that this book touched my heart and then ripped it out of my chest. You see I know the world is a cruel mean place but when your 15 and your uncle dies from AIDS all you know is that he's gone and you loved him. June is awkward, smart and unsure of the world around her. She likes to take walks into the woods near her house and pretend that she lives in a far off place, times before cars we're invented. It's something she shared with Finn, their love for old things. It's a place for Junie to be herself and alone. Finn was right. I could tell. Toby had nobody. But it was okay. It was all sealed. He had me now. I loved how June was written. She's 15 and unsure of herself at times, others she's blurting out her feelings. Carol Rifka Bruntwrote June perfectly, so believable and real. Being a 15 year old emotional girl myself I remember those jumbled up feelings. What takes place in the pages of Tell the Wolves I'm Home is truly amazing. I don't want to spoil anything, but the story that unravels was so real. Toby shows up and changes Junes ideas about her uncle and she truly begins to understand the relationship that Finn and Toby had. Her sister Greta was written as the jealous sister but at times she was so mean and cruel. I hated Greta for most of the book but in the end she redeems herself. It's impossible not to be touched by the events that take place inTell the Wolves I'm Home. I personally feel a connection not only to June but to Toby and Finn. I wanted to wrap them all up in a giant hug and protect them from any sickness and pain. Lastly on a personal note, when I was 15 years old my great Aunt Avis only son died of AIDS. Like Finn he went away for many years and he came home sick. I remember sitting on our front porch as my mother told me Jimmy was dead, the whole truth because I had a mother like that. I remember visiting my Aunt Avis many times and Jimmy's room stayed the same. A yellow start on his door and his name added to a quilt in memory of his life that was taken too soon. Aunt Avis lived to be 87, all those years without her son. When she died I remember crying so hard, not tears of sadness but joy because she was finally with her son.